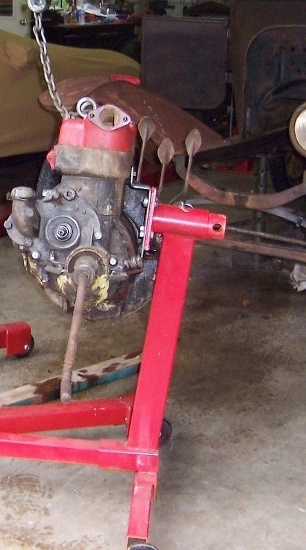 I am looking to buy a Engine stand and its use will be infrequent hopefully. Anyone use a harbor freight stand? will the engine fall on my toes or is it acceptable quality to work. I get the china made stuff, etc.. but I need something to hold my engine up while I find the clunking noise. Also if someone has one, do you have a drawing of the adaptor plate from the stand to the engine block that I can use. I have one thats has worked well for me. The adaptor plate will need to be bought from one of the suppliers. I did use a chunk of wood to use as a gap filler. I have the 4-legged version Harbor Freight not the tripod type. It's plenty strong to handle a model t engine, got it on sale for $70ish I think a couple of years ago. This earlier post has dimensions to make an adaptor plate. I just use the Lang's version of that plate on my Harbor Freight engine stand. 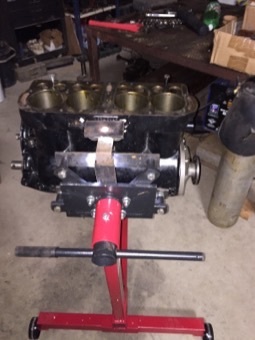 I haven't used my HF engine stand for a T engine yet but I have used it for small block ford engines and flatheads. It worked great for them so I'm sure a Model T engine will be fine with an adaptor. Quality was acceptable. I built the wooden one from plans on Fun Projects web site. Works great for storage, not really meant to use to work on the engine. Too low. I may set stand and all on a couple of sawhorses when I remove the hogshead to get the bands out. Mine works fine but I don't push motors all over the shop with it, just be careful if you do that the tripod design doesn't tip over. I cut off a junk front axle and welded a spindle on and use that in the stand as a spray fixture for wire wheels. Why don't you check your main bearing clearance before you pull your engine out of the car? 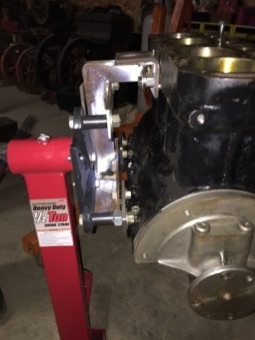 I have the harbor freight tripod engine stand with the Lang's adaptor plate. It has worked fine for me on three different projects. I used the HF one for 5 years, before I was fortunate enough to score an original KRW one. The difference between using the two of them is day and night. With that said, I'll say that the HF one did work for me for 5 years and many engines. The hole which holds the indexing pin gets wallowed out in use, so positioning the engine isn't as accurate as you'd like after that happens. But they do serve the purpose, and you can't beat the price unless you find a deal on a used one. As the others said, you can buy an adapter plate from one of the vendors (they work fine) or make your own like that if you have cutting and welding equipment. No problem at all with Harbour Freight stands. Mine has worked fine for my 2 T engine rebuilds. I have one and made the adapter myself. It works OK. Sometimes it is a little "tippy" if you are trying to roll the engine to work on the bearings/crankcase. Plus it almost takes two people to do that unless you've got a pretty good set of muscles. I drilled the plate I got with my engine stand to fit the water inlet holes. Then ground clearance on the bottom edge to assure no interference with the block. A couple 7/16-14 grade 5 bolts and it works great. Actually I've got an engine hanging on it as I'm typing this. Oh I nearly forgot. I also cut a sleeve to fit on the plate "post" so it wouldn't slide too far into the engine stand and I drilled 4 holes 90 degrees apart so I could pin the engine in all 4 important positions. Total cost? $0.00, Total time 1/2 hr.